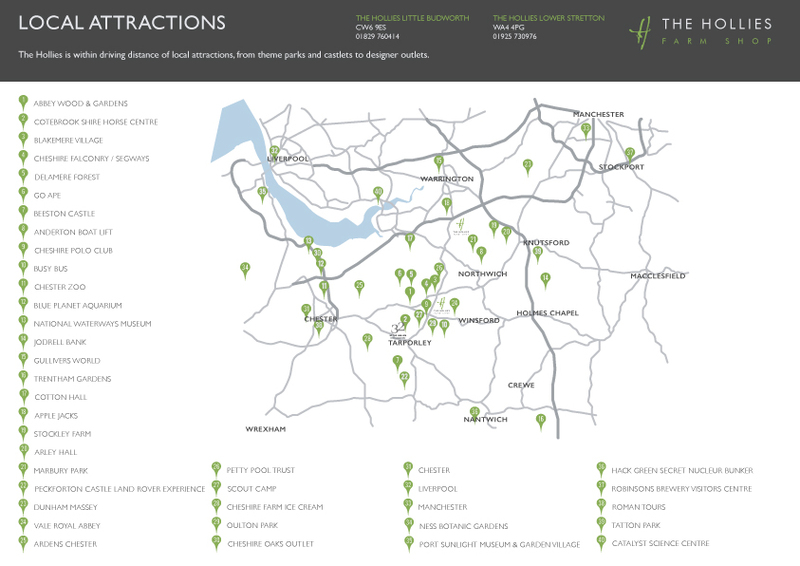 Local AttractionsWHAT TO DO IN THE AREA? Cheshire offers an abundance of fabulous attractions, beautiful scenery, delicious food and more. We work alongside Discover Cheshire and their website highlights all the best that Cheshire has to offer including a ‘What’s On’ calendar to help you to plan your trip. Abbeywood is a 45-acre family estate nestling in the Delamere countryside, right in the heart of Cheshire. Home to the Rowlinson family since 1987, Abbeywood is now open for visits and bookings, and has a Coffee Shop. Also used as a Wedding venue, it is worth checking their website for when it is open to the public throughout the year. Set in 50 acres in the heart of the beautiful Cheshire countryside, Cotebrook Shire Horse Centre & Countryside Park offers everything for the perfect day out. Home of the internationally renowned Cotebrook Shire Horse Stud, they have been breeding prize winning Shires here for over 40 years and they form the centrepiece of the Centre. Blakemere Village is an eclectic range of individual retail shops, activities and food establishments all set in and around an Edwardian stable block built in 1878. Perfect for gifts, furniture, antiques and activities along with a Falconry and a play barn. Fly birds of prey in the heart of Cheshire, take the gauntlet with Cheshire Falconry, get up close to nature, fly owls, hawks and eagles. Group adventures in the heart of Cheshire, including falconry, segway, arrow tag, archery. crazy golf. human table football and more! Cheshire outdoors can offer you unique adventures to suit your needs. Welcome to Delamere, a shady oasis in the midst of the agricultural landscape of the Cheshire Plain. Delamere is a place for families to let off steam, escape the crowds and find peace in the heart of the forest. Bring out your inner ape with three hours of tree top adventure including 30ft rope ladder and Tarzan swing. Don’t miss the new all-terrain Forest Segways! Enjoy a round of golf locally. Enjoy spectacular views and explore 40 acres of woodland trails, 4000 years of history, an abundance or natural wildlife and their exciting events programme. A fully restored boat lift in the heart of rural Cheshire. Enjoy a river cruise, journey through the lift and expect a warm welcome in the Visitor Centre and Coffee Shop. Encounter the fast and furious action of Polo also known as “the sport of Kings”. A brilliant afternoon can be found on our doorstep at The Cheshire Polo club located opposite our exit. Free pedestrian entry or £5.00 for cars. Pick up you picnic items from our Farm Shop and Delicatessen and enjoy a unique day out. Matches most weekends throughout Summer, check website for match fixtures. BusyBus were established in 2003 in Chester and Liverpool providing award-winning minibus and coach sightseeing tours, cruise excursions (from the ports of Liverpool and Holyhead ), 3-peak (3 peaks) challenge adventures, themed excursions and holidays. We offer a range of daily departures in our modern, executive mid-sized mini bus fleet. Every day is an adventure! Discover over 20,000 wonderful animals and 500 different species including some of the most endangered and exotic in the world. There’s a world of underwater adventure waiting to be discovered at Blue Planet Aquarium. Find the Blue Planet at Cheshire Oaks M53, J10. Open daily from 10am. With its delightful setting, flotills of historic boats and displays housed in fine Victorian buildings, the Museum is a great day out whatever the weather. Come and find the answers to the wonders of the universe at Jodrell Bank Discovery Centre. See the changing seasons in the 35 acre arboretum. Voted ‘Visitor Attraction of the year 2012’. Whatever the weather with more than 90 attractions, a day at Gullivers means fun, rides, entertainment and a very warm welcome for all the family. Visit the award-winning Trentham Gardens, for shopping and eating out, peace and quiet, fun and action! Indulge yourself at Trentham Shopping Village with shops, cafés, restaurants and the vast Trentham Garden Centre. Catton Hall, Based in the heart of Cheshire specialises in outdoor activities including clay pigeon shooting, quad biking, archery, falconry, air rifling and paintball games. For adrenalin junkies, try the Land Rover Experience and drive across the beautiful Cheshire countryside in one of their fleet of four-wheel drive vehicles, or try the quads and ropes course at their partner site just less than 10 minutes away. Vale Royal Abbey Golf Club was officially opened on October 1st 1998 and has since developed into one of the most desirable golf club’s in Cheshire. The Club is renowned for its extremely friendly and relaxing atmosphere, and their Members are proud of the welcoming environment that is provided at all times. While the Club is privately owned and operates as a predominantly traditional Member’s Golf Club, with policies being agreed by the Club’s Management Committee, the Club welcomes visiting golfers and parties as green fee paying visitors. A family business, based in Guilden Sutton, Chester in Cheshire on the Welsh borders. They are involved in Farming, Contracting, Haulage, Livery and you can try out their latest venture – quad trekking. With over 50 irresistible flavours of ice creams and sorbets and a brand new renovation with lots of outdoor fun for all ages… The Ice Cream Farm has everything you will need for a fun day out in Cheshire. Famous local motor racing circuit, hosts rounds of the British Touring Car and British Superbike Championships. Interesting and not too hectic or expensive for a family day out on practice days. Located off the A49 North of Tarporley. Check the motor press for event dates. Comprising of more than 145 boutiques, restaurants and cafés, Cheshire Oaks is the UK’s largest Designer Outlet . The Designer Outlet has a wide range of stores, offering something to suit every taste. Highlights range from athletic labels, like Nike and Adidas, and high-street favourites, like Marks & Spencer and Next, to a selection of iconic fashion brands, including Burberry, Polo, Michael Kors and Hugo Boss. Port Sunlight Village celebrates 125 years with festivals, events and special exhibitions throughout the year. This historic village is a lasting legacy to its founder William Hesketh Lever. Tatton Park is a 1000 acre historic deer park with farm, gardens, mansion and adventure playground. Discover the secret world of underground nuclear government. Declassified in 1993, the 35000 sq ft bunker contains authentic equipment in original settings to fire the imagination. Science has never been so much fun! Home to over 50 interactive exhibits, theatre and rooftop observatory gallery, as well as Saturday science clubs and holiday workshops. Ness Botanic Gardens cover 64 acres overlooking the Dee Estuary. Relax and indulge yourself in The Garden Kitchen Cafe, gift shop and plant sales. Presenting and illuminating the life of a Roman soldier in Britain, through informative, educational and interactive experiences for all ages including city tours of Chester. Delve into the brewing process, see the world’s largest Hopnik, meet the Shires, sample Robinsons’ finest cask ales, and round off your visit with a delicious homemade lunch. Chester is known for its landmarks, namely the city walls, the Rows and the black-and-white architecture. The walls encircle the bounds of the medieval city and constitute the most complete city walls in Britain, the full circuit measuring nearly 2 miles. The Rows are unique in Britain, those on the first floor are entered behind a continuous walkway, often with a sloping shelf between the walkway and the railings overlooking the street.Much of the architecture of central Chester looks medieval and some of it is but by far the greatest part of it, including most of the black-and-white buildings, is Victorian. Roman remains can still be found in the city, particularly in the basements of some of the buildings and in the lower parts of the northern section of the city walls. Liverpool is a place that combines in harmony a rich past with a bright future. Its ample history makes it a perfect destination for anybody looking to explore England’s vast cultural heritage. Also, it is an active city, where those looking to get around can find plenty of pubs and inns, and many festivals and exhibitions at any time of the year. Before the Industrial Revolution took hold in Britain, Manchester was nothing more than a market town. Since then it has since become one the UK’s leading and most innovative cities. It began with the importation of cotton from Liverpool via the Mersey and Irwell Navigation which transformed the textile industry as well as Manchester. The Duke’s Canal, also known as the Bridgewater Canal, built in 1761 was the first ever canal. In 1824 the Northwest city had one of the first bus services that ran between Market Street, Manchester and Pendleton, Salford. In addition, in 1830 the first ever steam passenger railway began operating between Liverpool and Manchester.